No matter that AdChoices platform is legitimate, a constant reappearance of AdChoices ads should notify you about the adware-type virus hiding in your computer. If you have been dealing with unwanted system changes and other issues, check the system with anti-virus. 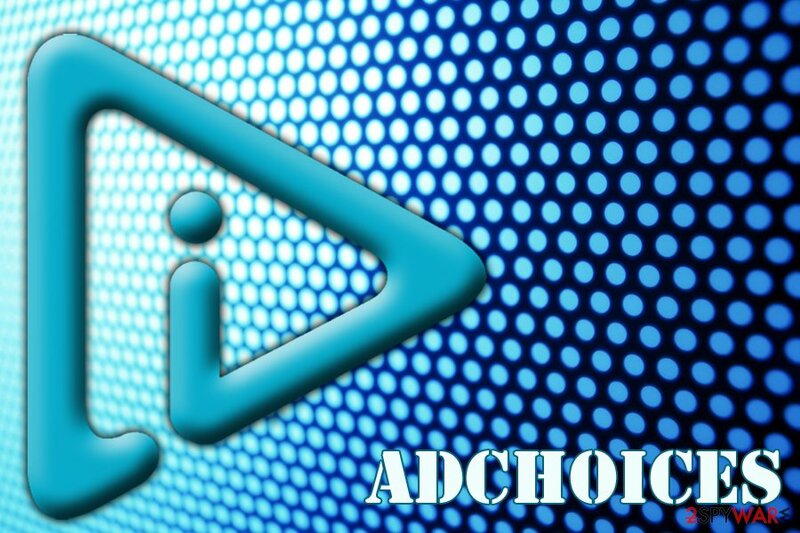 AdChoices is an advertisement service used by multiple organizations in Canada, the United States and various parts of Europe. Companies that are participating in the self-regulatory campaign include Google, Microsoft, AT&T, Bloomberg and more than 200 others. Since companies like Google earn more than 85% of their revenue through advertisements, targeted ads are what they are interested in. When done right, personalized advertisement is a great way of benefiting the end user and the third-party. However, AdChoices might raise some concerns when ads intentionally install adware or other PUPs on the user's computer. Besides, several industry experts are quite critical about how the gathered personal and non-personal information might be misused. Participants Google, Microsoft, AOL, etc. Symptoms Increased amount of ads, installed add-ons, changed browser settings, redirects, etc. Various types of AdChoices ads are following on every website and web page, but complaints start only when the browsing experience is diminished. Users claim that browsing the Internet becomes unbearable because of pop-ups, banners, and in-text ads appeared on their browsers. Frustrated users even call it “AdChoices virus”; however, we have to stress out it’s NOT a virus, because the campaign is heavily regulated. However, it does not stop bad actors to deliver annoying PUP while abusing this service. These programs might sneak into both Mac and Windows operating systems, so they can affect all popular web browsers. Once you notice an increased amount of ads, scan your computer with a reputable anti-malware program, such as Reimage or Malwarebytes MalwarebytesCombo Cleaner, and remove AdChoices pop-ups. ALL SUCH INFORMATION, PROGRAMS, PRODUCTS, SERVICES, AND MATERIALS ARE PROVIDED “AS IS” WITHOUT WARRANTY OF ANY KIND, INCLUDING, WITHOUT LIMITATION, ALL IMPLIED WARRANTIES AND CONDITIONS OF MERCHANTABILITY, FITNESS FOR A PARTICULAR PURPOSE, TITLE, AND NON-INFRINGEMENT. CERTAIN AREAS OF THIS SITE INCLUDE CONTENT PROVIDED OR POSTED BY THIRD PARTIES. DAA (“DIGITAL ADVERTISING ALLIANCE”) IS NOT RESPONSIBLE FOR THIS CONTENT OR THE STATEMENTS OR REPRESENTATIVES CONTAINED THEREIN. If you have been coming across suspicious ads while visiting your favorite websites (Youtube, Facebook, Google, etc. ), you should think what free application have you recently installed on your computer. It may be that you have been using a wrong way to install freeware and shareware on your computer what means that you have been allowing installation of commercial components (browser add-ons, extensions, plugins, toolbars, etc.) on it. To get the ability to see all optional components that are hiding in the freeware, you should select Custom or Advanced installation option. Also, make sure you uncheck all check marks that claim that you want to install browser add-ons, extensions, plugins, toolbars and similar components. However, if you have rushed software installation, now you have to solve this issue. Follow a simple removal guide presented at the end of the article. French-speaking users are advised to head to LesVirus.fr for instructions in their native language. Find the AdBlock product in your browser's Extensions/Add-ons list. Click on Options/Preferences next to the extension and deselect the Allow non-intrusive advertising option. Question. Surprisingly this morning I've found all my web browsers full of AdChoice virus ads. I assume I've run into some PC infection somehow and now need help since those ads are driving my crazy. Searching for help, I got nothing very helpful, except several YouTube videos on how to remove AdChoices ads, but none of them has helped. Could you please help? Answer. Yes, apparently, if you have found ads labeled something like 'Ads by AdChoices' during browsing, then you have installed the related component on your machine. To remove Ad Choices, you should use a guide that is given down below. After doing so, we recommend scanning the computer with Reimage because this way you will ensure your computer is totally safe and free of potentially unwanted programs, malware, file leftovers, and so on. Good luck! Question. I also have these Ad Choices ads on my Firefox web browser. I updated everything possible, installed several Malware Removal programs, and they did not find any of these AdChoices. What else can I do to get rid of this irritating app? Answer. Adchoices is not a virus, so if you want to get rid of this program, you should follow a guide given below. Question. Hello. I have one question related to online ads. Sometimes I get confused by them. Recently I've noticed that when browsing with Chrome, Opera, and Firefox some words are highlighted and brings up an ad when I hover the mouse over them. Most of them are marked as 'Ads by AdChoices'. Could you please tell me whether they indicate some infection or is that just normal? Answer. Hello. 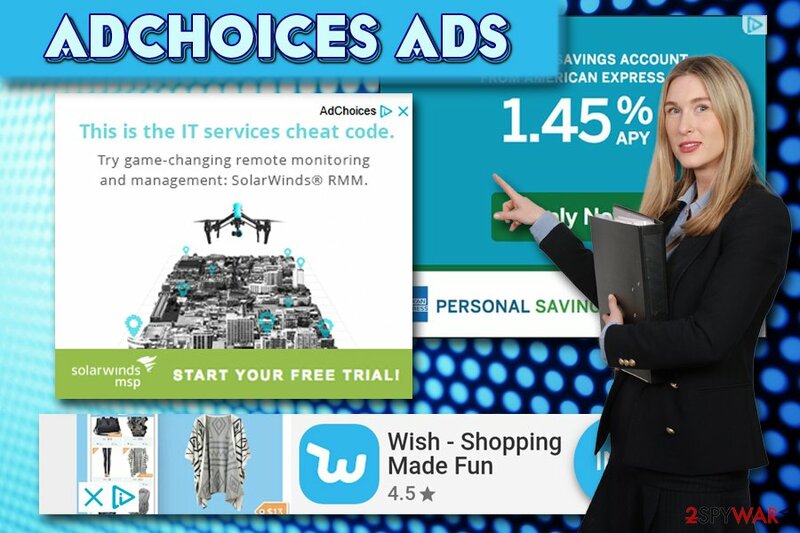 The answer is simple – seeing AdChoices advertisements is certainly NOT a dangerous thing but if they have been bothering you then you should think what commercial program have you recently installed on your computer. The easiest and the most reliable way to get rid of it is to follow manual removal guidelines that are given below. Question. I've recently downloaded Java and Flash Player updates. It seems that by doing so I've installed something suspicious because each of my web browsers has started generating tons of ads powered by AdChoices. What should I do to stop this from happening? Answer. Technically, Ad Choices is not a virus. It's rather an advertising tool, which displays different kinds of ads. In this case, we recommend you follow manual removal guide that is given down below and fix your computer. Question. I don't understand what's the matter with my computer or with me since ads constantly show up on my computer. This time, I'm dealing with AdChoices but cannot get rid of its no matter what I try. Please help! Answer. It's interesting what actions did you take to remove AdChoices ads. Technically, this program is not a virus, so that you can use a guide below. 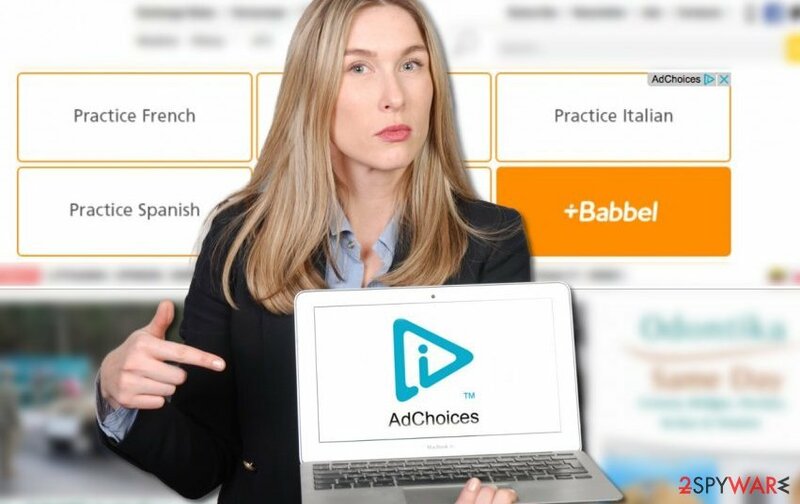 If you have been looking for AdChoices removal tool, you should understand that you need to find and uninstall related browser add-ons and extensions from each of your browsers. Carefully follow our step-by-step guide bellow. Make sure that you eliminate all suspicious components. After doing so, we think that you should run a full system scan with updated anti-spyware to make sure that your computer is totally safe, and there are no programs that are considered unsafe. If you have difficulties in locating and eliminating these entries, you should launch automatic removal. To remove AdChoices ads automatically, you have to employ professional malware removal program. To remove AdChoices ads from your computer, you have to locate and eliminate adware and other suspicious programs. It's important to delete all questionable programs. After doing it, you should scan your computer with an anti-spyware program. Just to make sure your computer is clean and safe to use. Here, look for AdChoices or any other recently installed suspicious programs. To remove ads by AdChoices completely, you have to find and uninstall all suspicious applications from your computer. When you finish, you should scan your PC with a strong anti-spyware program and make sure that you removed all suspicious components. Wait until you see Applications folder and look for AdChoices or any other suspicious programs on it. Now right click on every of such entries and select Move to Trash. Check the list of add-ons and remove all suspicious toolbars, extensions, and plugins because they might deliver AdChoices ads. When in the new window, check Delete personal settings and select Reset again to complete AdChoices removal. Follow the instructions below and remove all questionable extensions from Microsoft Edge. Once these steps are finished, AdChoices should be removed from your Microsoft Edge browser. Look through the list of recently installed extensions. Some of them might be the reason why your browser was flooded with ads. Remove them all. Here, select AdChoices and other questionable plugins. Click Remove to delete these entries. Now you will see Reset Firefox to its default state message with Reset Firefox button. Click this button for several times and complete AdChoices removal. Check the list of extensions and uninstall all questionable entries. Strange toolbars, plugins, and add-ons might be the reason why AdChoices ads flooded Google Chrome. Here, select AdChoices and other malicious plugins and select trash icon to delete these entries. Click Reset to confirm this action and complete AdChoices removal. Attentively follow the instructions and remove all questionable extensions from Safari. Some of them might be responsible for disturbing your browsing sessions. Here, select Extensions and look for AdChoices or other suspicious entries. Click on the Uninstall button to get rid each of them. Now you will see a detailed dialog window filled with reset options. All of those options are usually checked, but you can specify which of them you want to reset. Click the Reset button to complete AdChoices removal process. ^ Erin Sagin. All About AdChoices: What Is AdChoices? How Does it Affect Advertisers . WordStream. Online Advertising Made Easy. ^ George Fotiadis. How does Google earn money?. Hackernoon. How hackers start their afternoons. ^ How do advertisers show me custom ads?. HowStuffWorks Computer. Gets you explanations, reviews, opinions and prices for the Internet, home networking, hardware, and software. ^ DNS Unlocker virus renewed its activities. VirusActivity Blog. News about malware activity. ^ Examples of Private Information. Weber State University. Information Security Office. This entry was posted on 2019-04-01 at 00:40 and is filed under System tools, Viruses. How did you remove AdChoices?